combining them all in a fashion ruggedly masculine. Typically Jantzen in its permanent perfect fit, its seasonal style and color leadership, and in the truly marvelous elasticity of the JaRtzen-stitch. 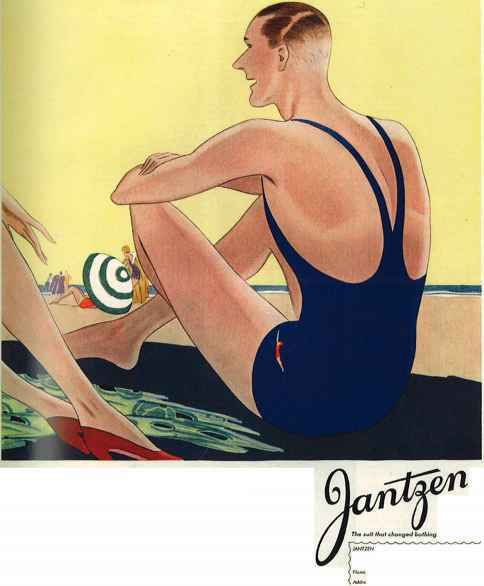 It really is easier to swim in a Jantzen. addition to the Sunaire and the Speedaire, (both illustrated), there are many other smart models for men, women and children...including the popular Shouldaire, men's and boys' Diving and Speed Suits, and Twosomes for men and women. You'll find the famous red Diving Girl emblem on every genuine Jantzen. Your weight is your size, "w 'Jantzen Knitting Mills, Portland, Oregon; Vancouver, Canada; London, England; Sydney, Australia. KNITTING MIUS. (0.J* KM). fWrtoxd. Or^<y> FUof twid M (lyf. Mdf m coJor >931 *cd*h.
Thomas Lowinsky, 'Clyte abandons the old sun for the new', from Modern Nymphs by Raymond Mortimer, 1930. Hand-coloured line block. Courtesy V&A Images/Victoria and Albert Museum. In a reworking of Greek mythology, Lowinsky's Clyte basks in a pool of artifical sunlight. Sun worship in the 1920s and 1930s was closely allied to the craze for exercise and diet regimes, callisthenics and the celebration of the naked form. fruitions Picrru la ft He. 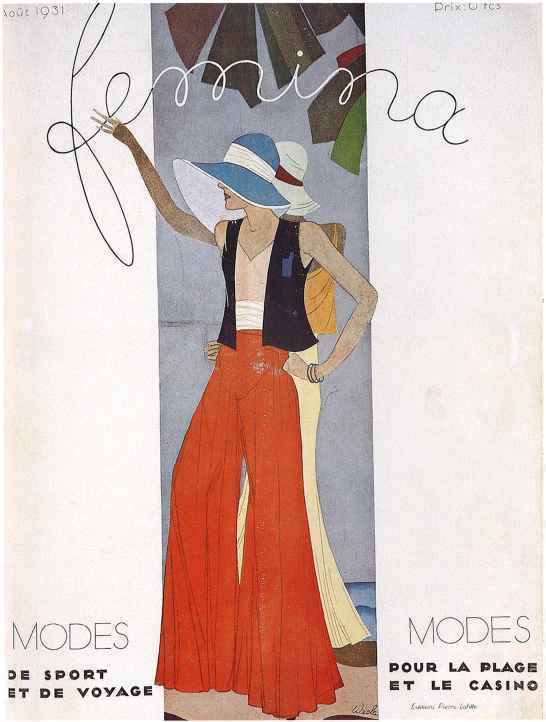 Weclawowicz, Cover of Femina, August 1931. CSM Archive. Flared beach-pyjama trousers, worn by a superbly toned model, are teamed with a brief gilet and vest and a broad-brimmed sun hat. Pyjamas were also worn for lounging on informal occasions. Weclawowicz, Cover of Femina, February 1931. CSM Archive. Like Haramboure and Demachy, Wecla, as he often signed himself, was a frequent contributor to Femina. 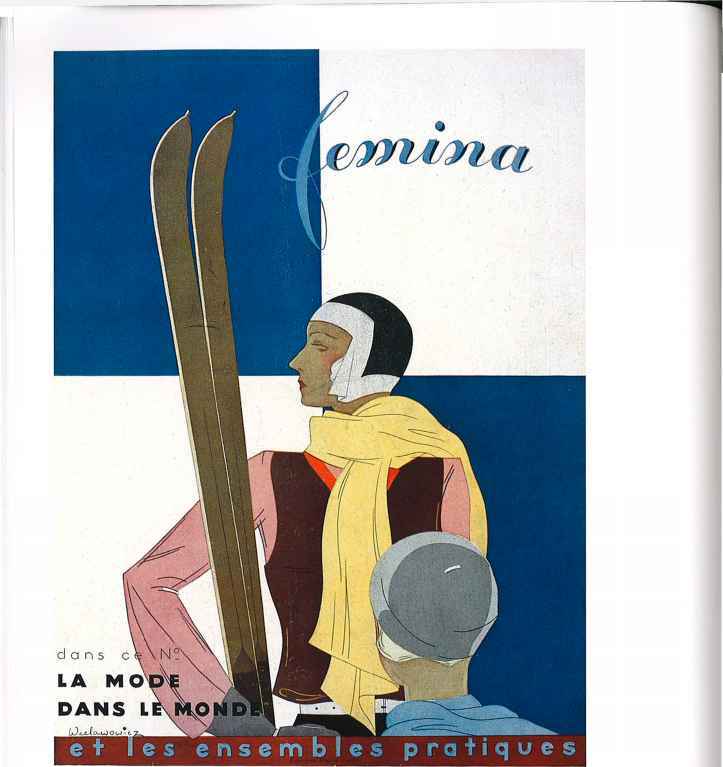 An elegant skiing ensemble is set against a geometric background. Pierre Mourgue, 'A Saint-Moritz', Femitia, Christmas 1932. CSM Archive. 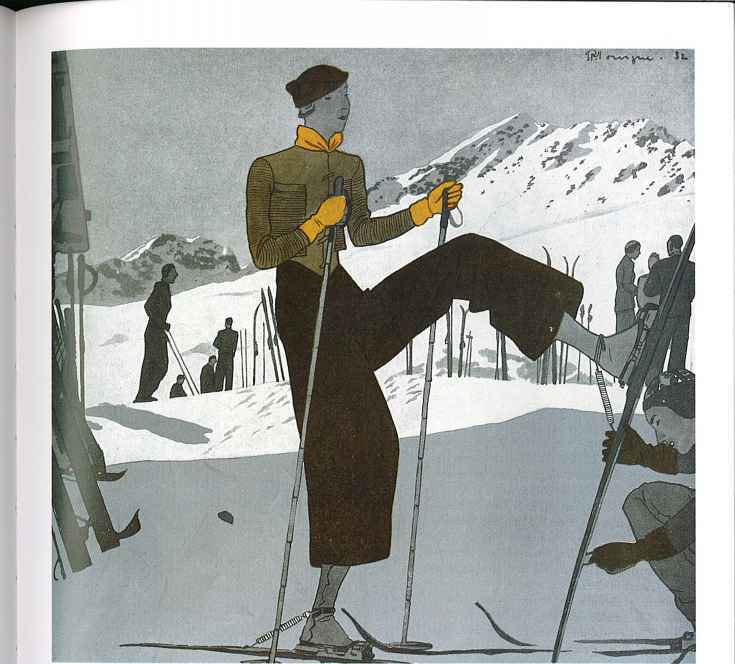 Plus-fours and a short military-style jacket in jersey fabrics by Rodier are teamed with knitted accessories in this skiing outfit by Schiaparelli. 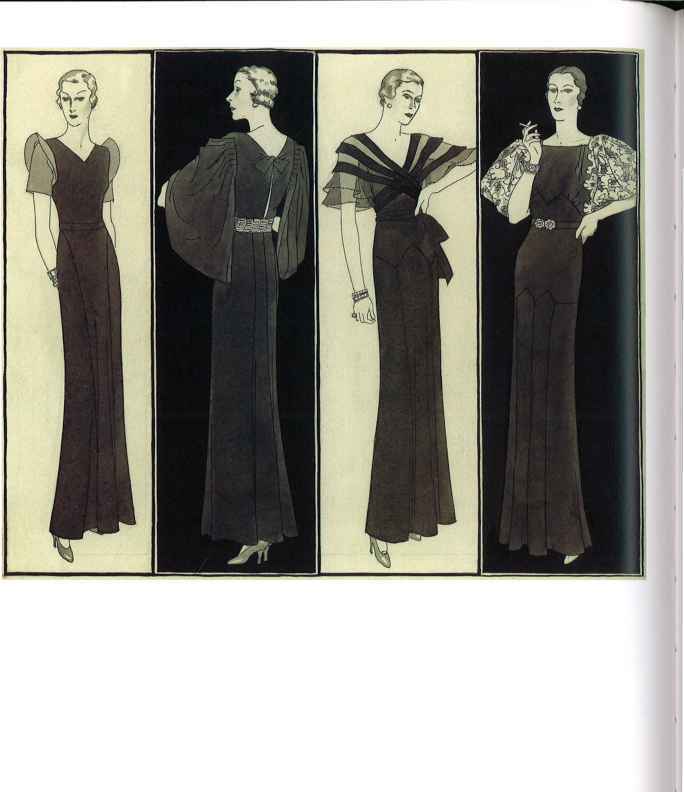 Polly Tigue Francis, Four designs for 'Practical Dressmaking' for American Vogue, 1932. Courtesy CORBIS. 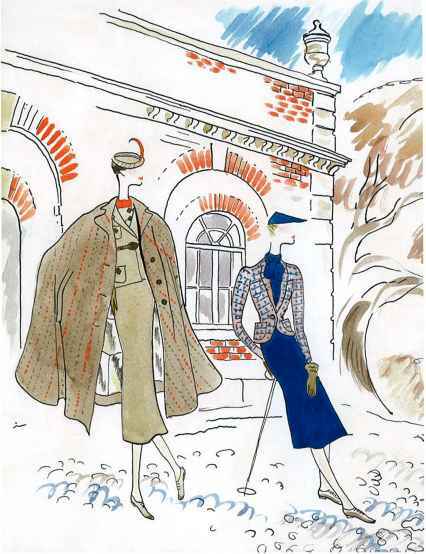 Francis was one of Conde Nast's illustrators based in Paris. An increased emphasis on the shoulders heralds a more masculine look. Lee Creelmcm, Caped dresses by Redfern and Lucite Paray, American Vogue, 1932. Courtesy CORBIS. The bias cut is evident here in the long, gently flared skirts of these caped ensembles. 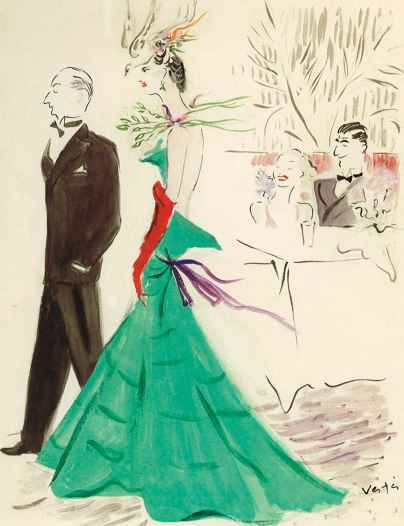 Creelman was destined to be overshadowed by her husband, Corl 'Eric' Erickson, who become one of Vogue's most celebrated illustrators. Weclawowicz, Cover of ¡'emina, Spring 1932. CSM Archive. Wecla's cover shows the new style of hat - brimmed and tilted to one side, allowing for slightly longer, gently waved hair. The cloche was no longer in fashion. 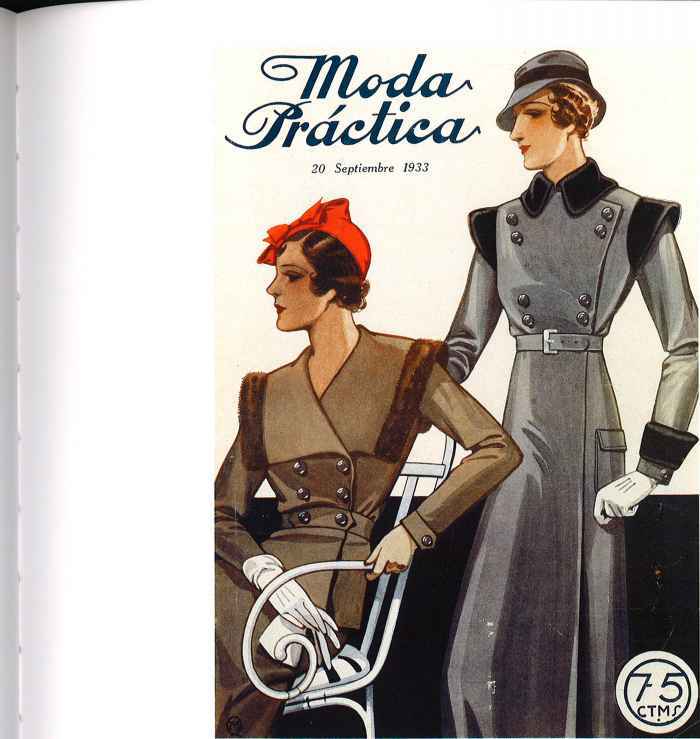 Q.M., Cover of Moda práctica, September 1933. Courtesy The Stopletori Collection. 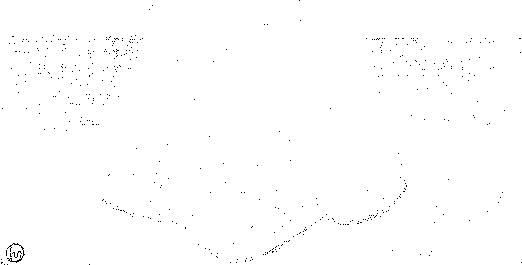 Spain, like the rest of Europe, took its lead from Paris in both fashion and its illustration, though Spanish illustration was mostly relegated to lifestyle images or advertising. 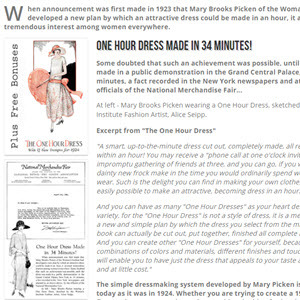 The outbreak of the Civil War in 1936 arrested the development of any potential indigenous fashion industry. 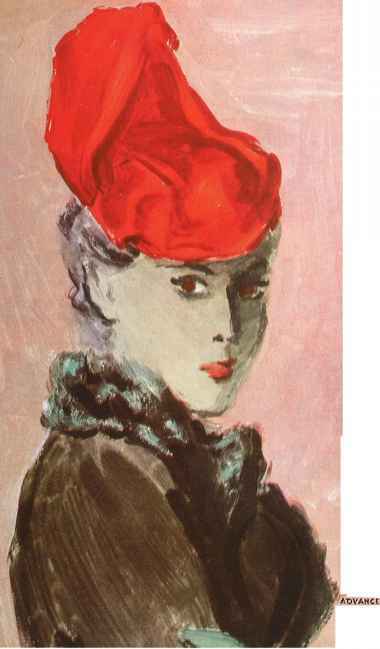 René Bouët-Willaumez, Woman in Suzanne Talbot toque hat, American Vogue, 1934. Courtesy CORBIS. Bouët-Willaumez, along with his rival, Eric, reported for Vogue from Paris until relations became so strained between them that he was posted to London. However, the two men successfully introduced a style that was not only aesthetically pleasing, but also realistic and informative. René Bouët-Willaumez, La Marquise de Paris in evening gown by Augustabernard, American Vogue, September 1933. Courtesy CORBIS. 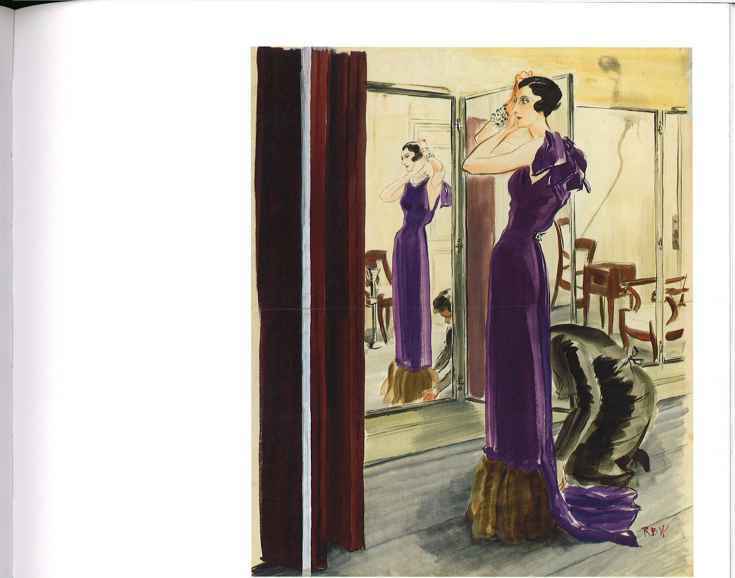 Although the emphasis of the gown is at the back, as was often the case during the 1930s, Bouët-Willaumez also depicts the front by posing his model before a mirror - a time-honoured artistic convention especially useful for the fashion illustrator. 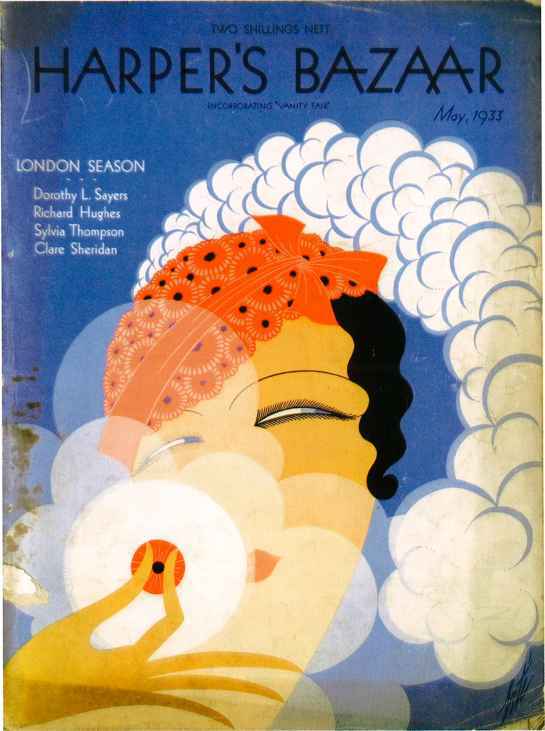 Ert6, Cover of Harper's Bazaar, May 1933. Private Collection. The cosmetics industry bcomed during the interwar years and Ert§ makes full use of the decorative possibilities afforded by their use. 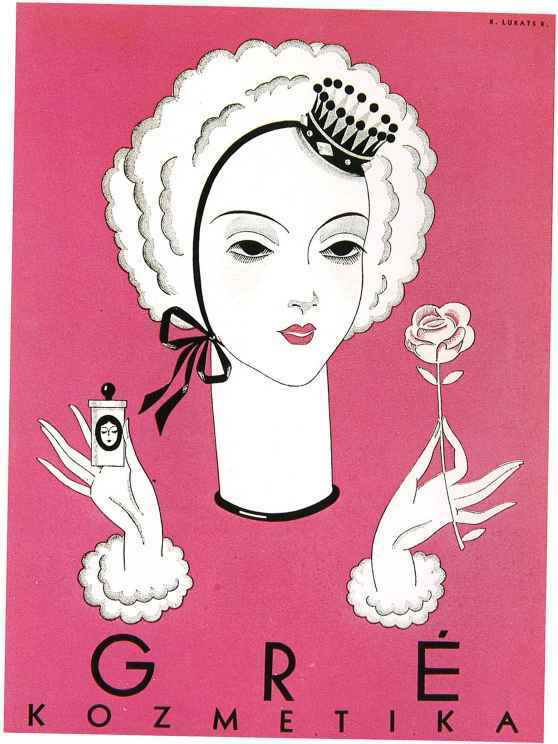 Kato Lukats, Showcard for Gré Cosmetics, c.1934. CSM Archive. Two colours are used to great effect in this showcard by an Hungarian artist. Ruth Sigrid Grafstrom, Woman in striped jacket, American Vogue, February 1933. Courtesy CORBIS. 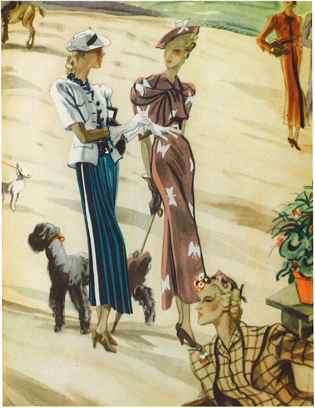 Grafstrom illustrated for Vogue throughout the 1930s. 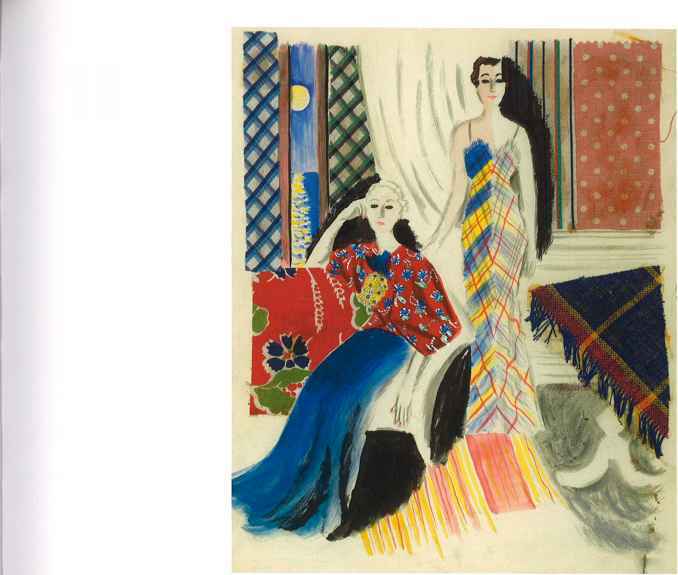 Her painterly style owes much to the influence of Matisse. Ruth Sigrid Grafstrom, Two women in evening dress, American Vogue, May 1934. Courtesy CORBIS. Here Grafstrom uses fabric collage to give texture to her illustration. Cecil Beaton, Tweed ensembles by Enos and Fortnum & Mason, British Vogue, September 1934. Courtesy CORBIS. 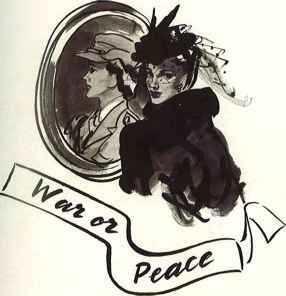 The society photographer Cecil Beaton wrote and illustrated for Vogue from 1926, before going on to become one of its regular photographers. His illustration was not as successful as his photographic work, but he was invaluable as an observer and commentator on the international social scene. 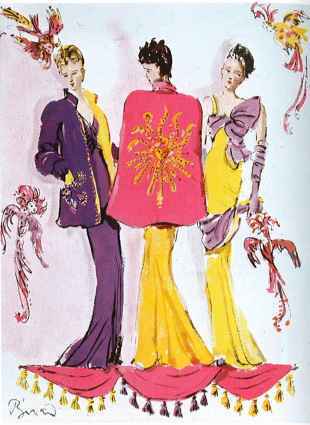 Cecil Beaton, Schiaparelli and Worth evening gowns, British Vogue, February 1934. Courtesy CORBIS. 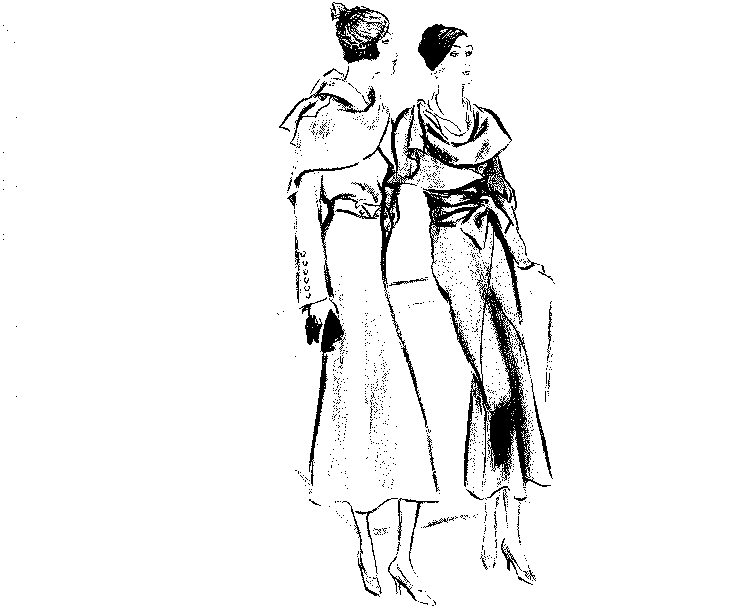 These gowns show the widening silhouette of the shoulders already evolving well before the Second World War. The House of Worth, founded in 1858 by the so-called father of haute couture, Charles Frederick Worth, continued to operate until 1952. René Bouët-Willaumez, Woman in hat by Agnes, American Vogue, August 1935. Courtesy CORBIS. 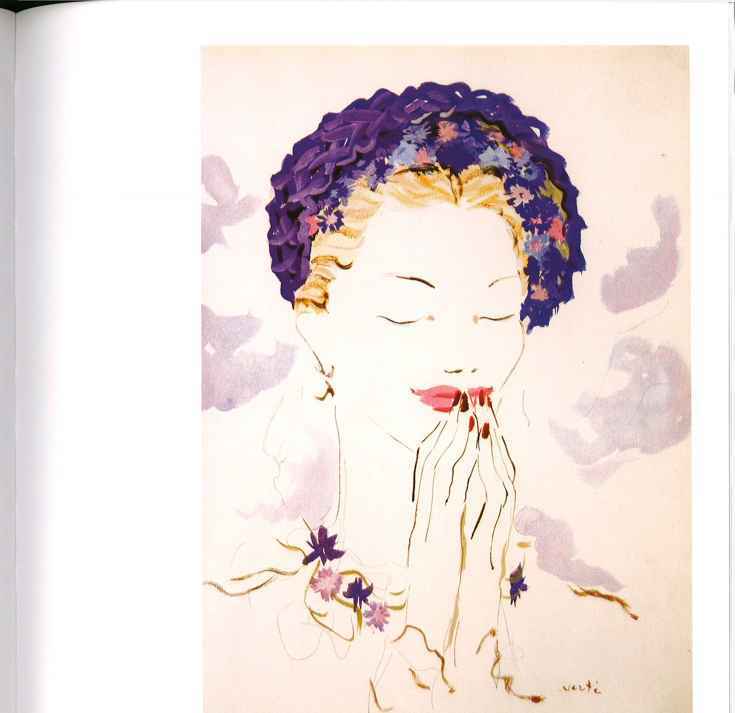 Bouët-Willaumez was a master of colour, evident in this delicate illustration of a hat by Agnes, a famous Parisian milliner, which demonstrates the increasingly exuberant shapes fashionable in the 1930s. A sable collar completes the ensemble. 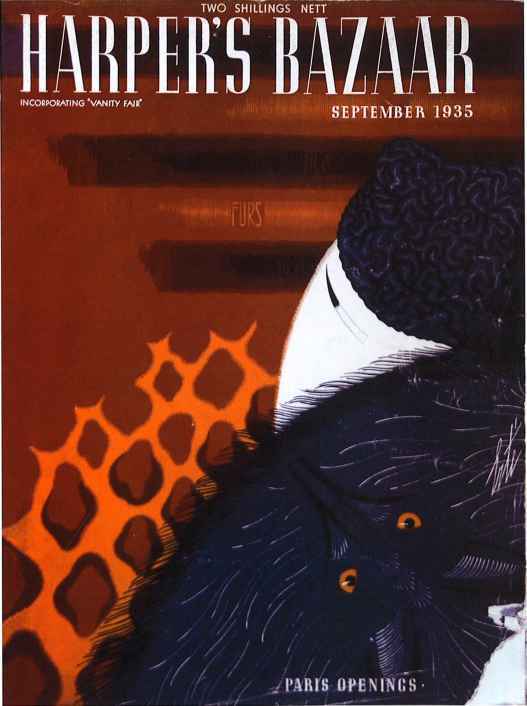 Erte, Cover of Harper's Bazaar, September 1935. Private Collection. Erte's essentially decorative style still finds a place despite the trend towards realism. Fox fur, leopardskin and astrakhan are used to great effect in his stylized rendition. Fashion leader* on the Riviera facor silk net whirls in the new Algerian brown, with half sleeves a ml o/kh front, we/m with light grey shorts and brown ami ichite Norwegian slippers. This outfit is ideal for deck games, luncheon, cocktail*, and for wear to and from the cabaiia or beach club. The Mexican poncho, made in Ught-weight terry cloth a nd other toweling fabric* in the new reel color, suvjAants the beach robe. It it ideal for lounging on the beach or for use aboard ship as a robe to be worn on deck. Originally icorn at St. Traitez, French Riviera. At porU of call in the tropics, lightweight suits of silk, linen, I'aim Beach cloth and "/nthetic fabric* ore all-important in the new hemp color. 'This single breasted model is worn with a tan Madras shirt with lounge collar attached, plain color Shantung silk tie, lightweight hose, reverse calf shoes, and Ho mini y bowler or pith helmet. Robert Goodman, Holiday wear for men, Esquire, c.1935. Courtesy The Advertising Archives. 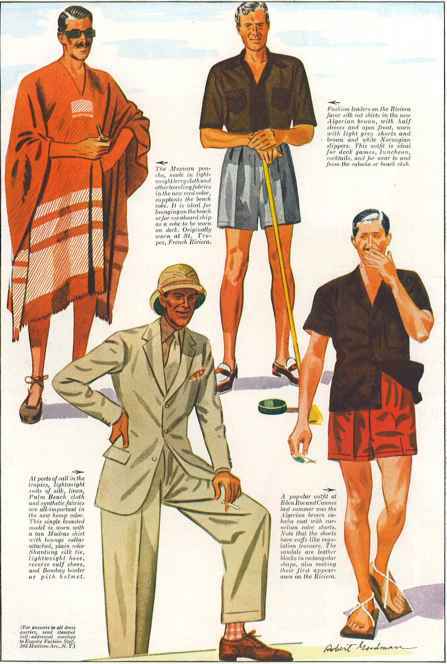 A safari suit worn with pith helmet, bermuda shorts and a Mexican poncho show the multitude of international influences absorbed by the US menswear market before the war. Esquire, owned by the Hearst Corporation, was launched in 1933. 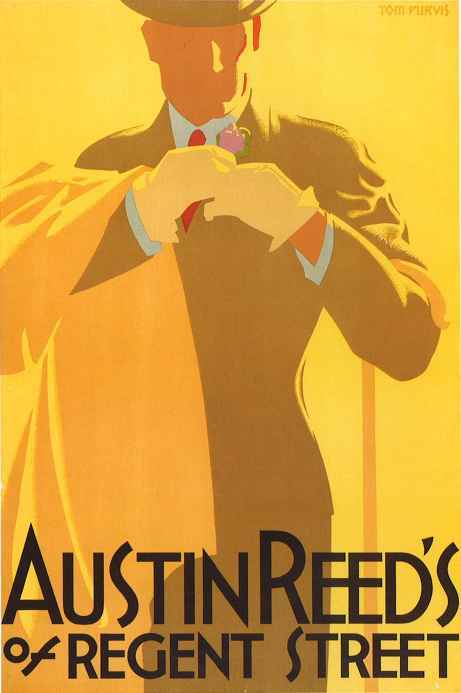 Tom Purvis, Advertisement for Austin Reed, Regent Street, London, c.1935. Courtesy The Stopleton Collection. A traditional men's outfitter, Austin Reed opened in the City of London in 1900. Its flagship store in Regent Street, the heart of the West End, was established in the 1920s and is still there today. Purvis's dramatically simplified style was well sated to the requirements of large-scale advertising posters. Eric, Cover of British Vogue, September 1936. 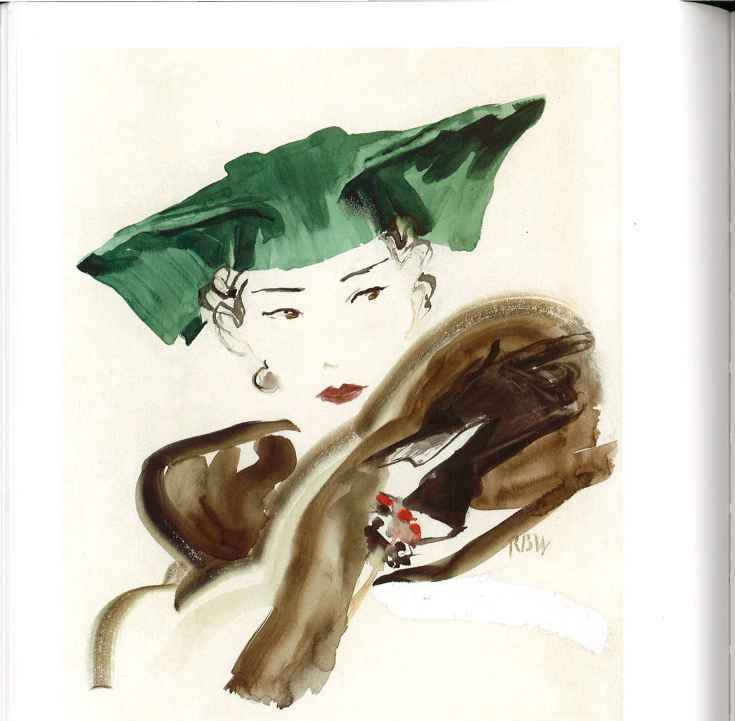 Courtesy The Condé Nast Publications Ltd.
Surrealist-inspired velvet hat and caracul (lambswool) scarf streaked with blue-green by Schiaparelli. According to Condé Nast, Eric's work, always drawn from life, 'combined a certain realism with understanding and conviction in portraying the spirit of today's elegance'. 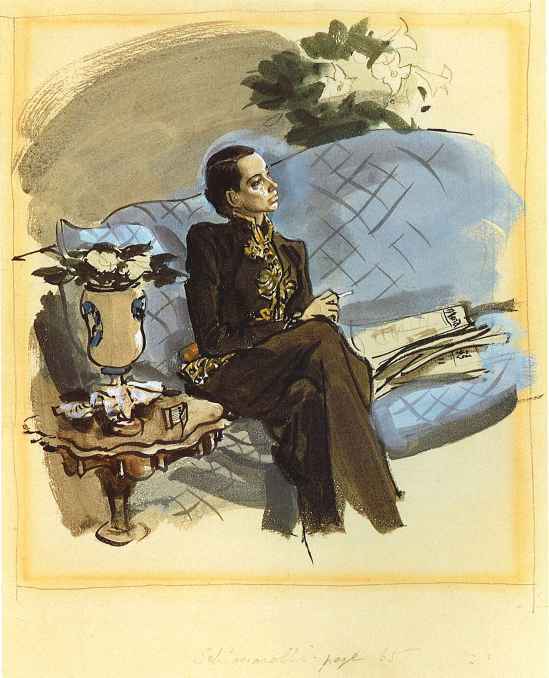 Francis Marshall, Portrait of Schiaparelli. 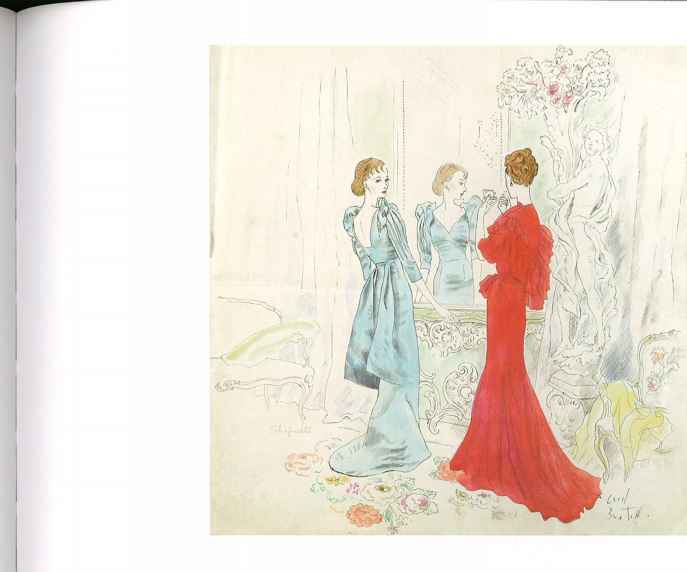 Original illustration for British Vogue, 1936. Gouache. Courtesy The Zahm Collection, Germany. Schiaparelli wears a tailored evening suit with military-style embroidery. 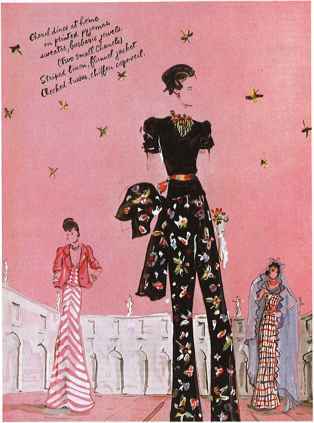 Marshall, taken on by British Vogue in 1928, was an acute observer of British high society and one of the greatest British fashion illustrators. Marcel Vertès, Couple in a restaurant, American Vogue, March 1936. Courtesy CORBIS. Where Francis Marshall (previous page) was often gently ironie in his images of fashionable society, Vertès, an Hungarian émigré to France, was often more cruel. Carlos Saenz de Tejada y de Lezama, 'Cocktail Chic', Vertice, May 1937. Courtesy Mary Evans Picture Library. Published between 1937 and 1946, the right-wing Spanish magazine Vertice reflected Nationalist views. 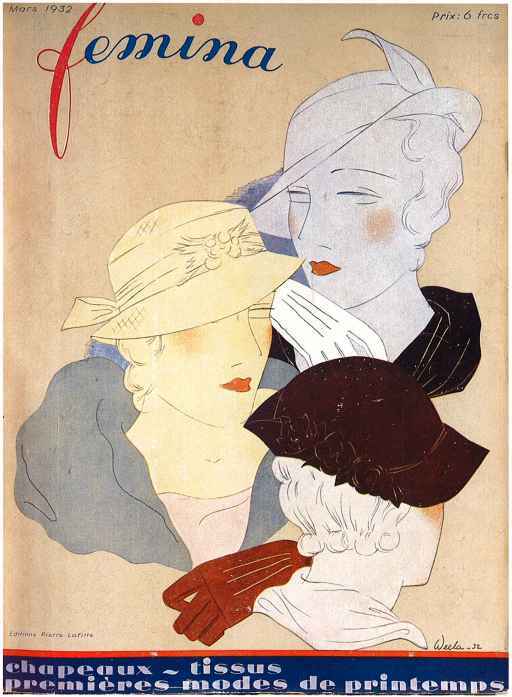 De Tejada worked in Paris between 1926 and 1935, contributing to Femina and Vogue, before returning to Spain. Carlos Saenz de Tejada y de Lezama, 'Dog-walking Chic', Vertice, May 1937. Courtesy Mary Evans Picture Library. These middle-market styles do not reflect the verve of Spain's most significant contribution to fashion in the mid-20th century: the designer Balenciaga, who left Spain at the outbreak of the Civil War and showed his first Paris collection in 1937. 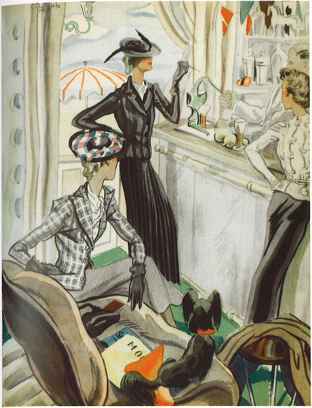 Christian Berard, Chanel designs, Vogue, July 1937. Courtesy V&A Images/Victoria and Albert Museum. 'Chanel dines at home in printed pyjamas, sweater and barbaric jewels ' Coco Chanel epitomized the modern woman in her life as well as her work. Trousers, here worn for the evening, were one example of the many garments she adapted from the male wardrobe. 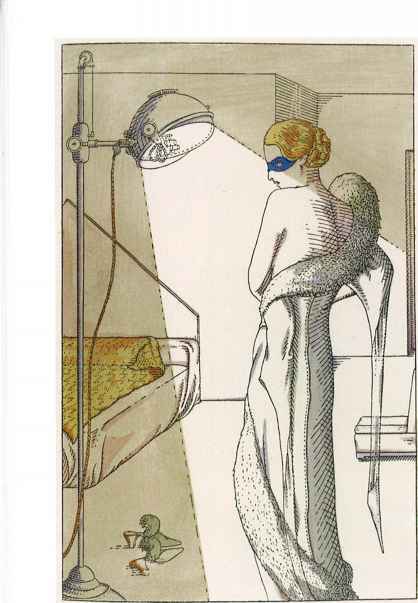 Christian Berard, Schiaparelli designs, Vogue, October 1938. Courtesy V&A Images/Victoria and Albert Museum. Surrealist imagery is embroidered onto Schiaparelli's evening cape. In the late 1930s she launched a series of themed collections, including the Astrological collection from which these models derive. Georges Lepape, Cover design for French and British Vogue, 1938. Pencil. Courtesy Galerie Bartsch & Choriau, Munich. Lepape's last cover for Vogue brought to an end an association that lasted 22 years and included over 80 covers. The figure wos eventually modelled in plaster and photographed against a realistic background, perhaps signalling Lepape's acknowledgement of the growing supremacy of that medium. Marcel Vertes, Suzy toque, Harper's Bazaar, June 1938. Private Collection. 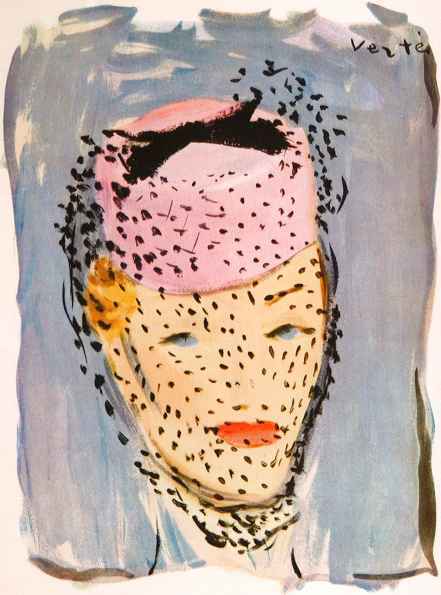 When not indulging in caricature, Vertes could produce charming work, as in this depiction of a sugar-pink toque with a spotted black veil. Marcel Vertes, Reboux bonnet, Harper's Bazaar, June 1938. Private Collection. A bonnet by Reboux with cornflowers filling the brim at the front and a halo of dark-blue straw at the back. 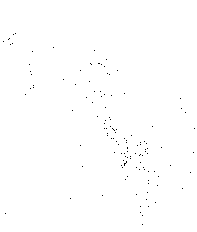 In the early 1940s Vertes moved to the USA. Hof, Men's evening suits by Simpson's, 1938. Courtesy Museum of Costume, Both. Formal wear for men still required either a dinner jacket, worn here wilh a soft-collared shirt and black tie, or a tailcoot, worn with white tie, waistcoat and stiff collar. 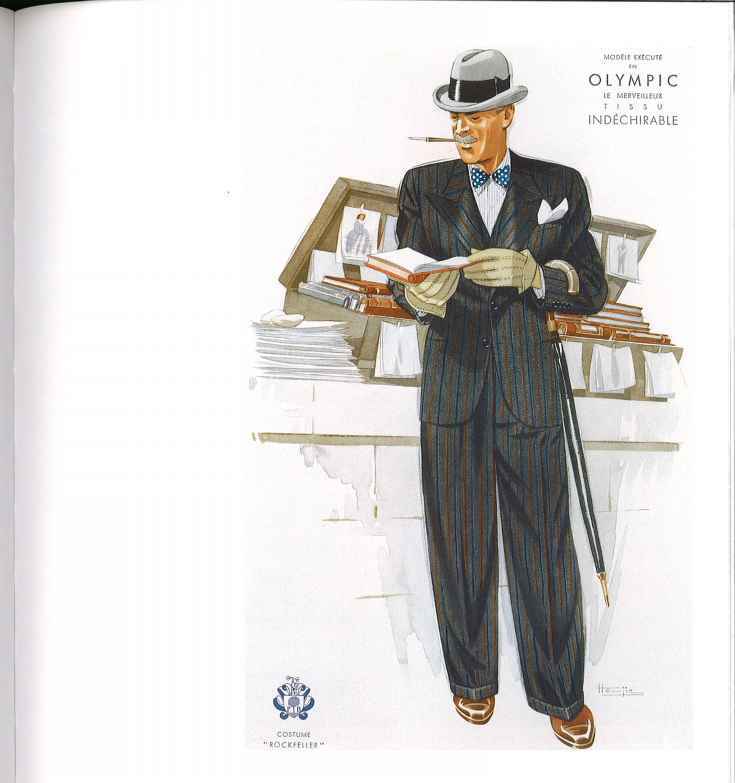 Hemjic, Advertisement for Olympic's 'Rockfeller' suit. Courtesy The Stapleton Collection. The wider American cut of informal suits for men was generally adopted by the late 1930s. Broad-shouldered, and close-fitting over the waist and hips, the jacket was worn with loose, draped trousers with turn-ups. A grey fedora hat completes the outfit. 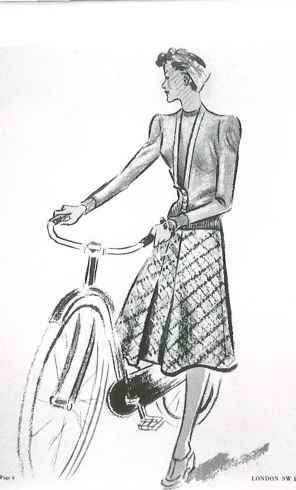 Anonymous, Twinset and tweed skirt by Harrods, 1939/40. Courtesy Museum of Costume, Bath. With the outbreak of the Second World War, the English style was readily adapted to the practical requirements of wartime clothing. The turban-like scarf tied round the head was an informal alternative to a hat. 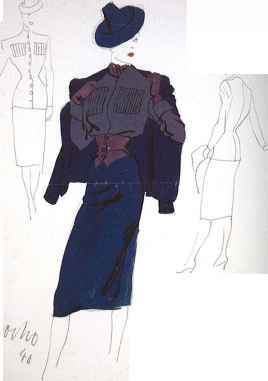 Herbert Mocho, Design for a suit, Berliner Mode, Winter 1940. Courtesy BPK Berlin. While in Germany Paris fashion was dismissed as 'degenerate', 'unpatriotic' and a threat to the 'true German look', it was nevertheless eagerly consumed by those who could obtain it. The Occupation of Paris meant that much of the couture output was directed towards Germany. 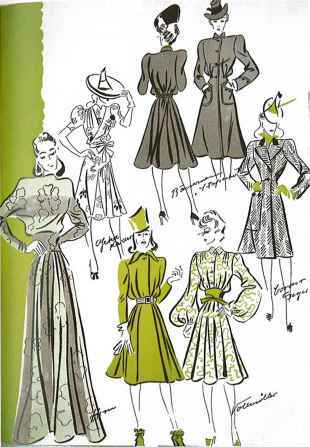 Anonymous, Designs from Berliner Mode, Spring 1940. Courtesy BPK Berlin. During the war, clothes rationing in Germany was as strict as in other countries. The 'Aryanization' of the domestic fashion industry, largely dependent on a Jewish workforce, resulted in its almost complete collapse. 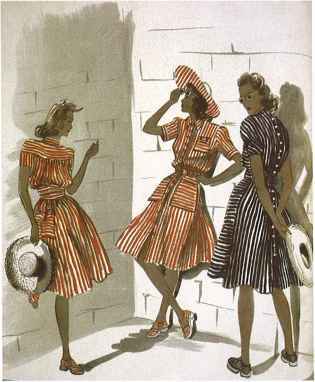 Anonymous, Designs from Berliner Mode, Summer 1941. Courtesy BPK Berlin. Summer fashions hint at the patriotic dirndl skirt shape promoted by the Nazis. Wood- or cork-soled shoes became an economic necessity due to the shortage of leather. Francis Marshall, Taping the Windows', c.1939, from London West, 1944. Private Collection. Published in 1944, Marshall's book London West is a unique record of society life in London during the 1930s, up to and including the early war years. Marshall served in the navy during the war while continuing to illustrate for Vogue. Francis Marshall, 'Tea in the Blitz', 1941, from London West, 1944. Private Collection. The newspaper headline shows that this drawing was done in 1941 during the height of the Blitz. Sudden air-raid warnings meant that the dress code for the shelters was 'come as you are*. Donia Nachshen, 'Go through your Wardrobe', from Make Do and Mend, 1940s. Courtesy The Advertising Archives. 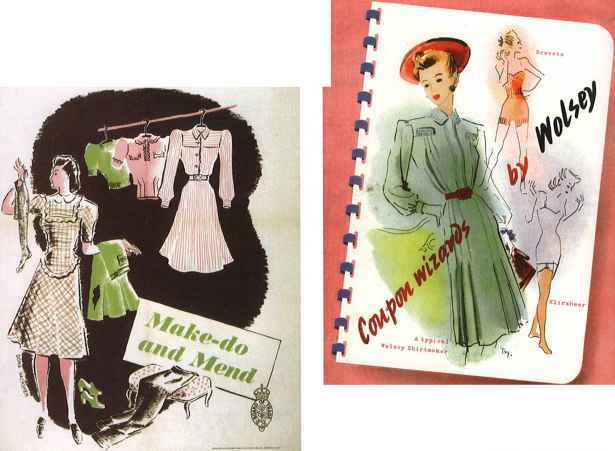 The 'Make Do and Mend' campaign booklets were prepared for the Board of Trade and published by the Ministry of Information. 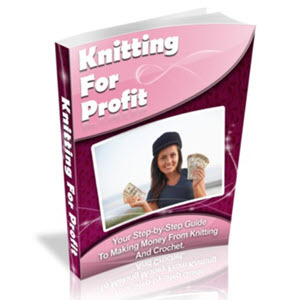 They were packed with useful tips on mending, renovating and caring for clothes. 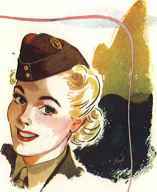 T. W., Advertisement for Wolsey, 1940s. Courtesy The Advertising Archives. Founded in the mid-18th century in Leicester, Wolsey started as an hosiery and underwear manufacturer. The square shoulders, short skirt and economical use of fabric in the 'shirtmaker' are typical of rationed fashion. 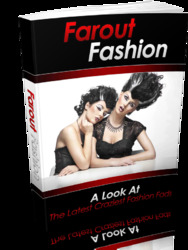 Get All The Support And Guidance You Need To Be A Success At Far out Fashion. This Book Is One Of The Most Valuable Resources In The World When It Comes To A Look at the Latest Craziest Fashion Fads. How to cut a dress on the bias side of fabric? When was wing collar last worn with suit?